The Olney State Forest is an ideal place for camping and picnicking. The perfect getaway for nature lovers, the forest has several camping areas and nature trails suitable walking and biking. 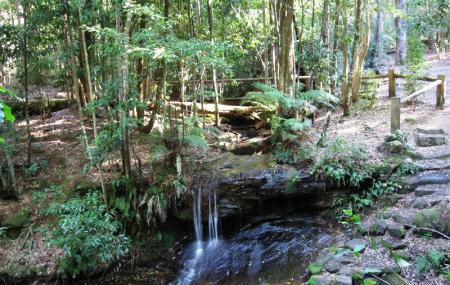 The Pines Picnic area, which is the most popular area in the forest, has a trail that leads to the Abbot Falls. The Casuarina Camping Area accommodates caravans and trailers and is located close to several trails. The Rock Lily Trail is a picturesque walk among rock lilies, geebungs and ferns. The Basin Camping area is open and grassy with easy access and a flowing creek that can be used for swimming in warmer months. The trails are not maintained and visitors are advised to be cautious. Ensure you carry enough food, refreshments and other important supplies. Wear comfortable shoes and clothing that is weather appropriate. How popular is Olney State Forest? People normally club together Shelly Beach and Eraring Power Station while planning their visit to Olney State Forest. People also prefer to end their day with Olney State Forest. Great day out. Wildlife. Walks. Nature. Beautiful. Great place. Took the dog, he loved it. Was wonderful and serene until some people in 4WDs decided to chop down a tree nearby for God knows why??? Lovely quiet area in the Pine Forest. Clean and tidy. Walking trails to keep the grand kids on the go..